For too long, I ignored my closet. My pants situation was dire. Crotches were torn, knees were ripped, and I was bereft of any pants but for a single pair of jeans and one pair of khakis. Yet all was not lost. Dear reader, before we venture further, I must be honest. I am fearful of being left behind. This fear has a single cause. I once had a boss who used his hoary AOL email address for far too long. When he was fired, our colleagues in human resources did not deign to mention his @aol.com. 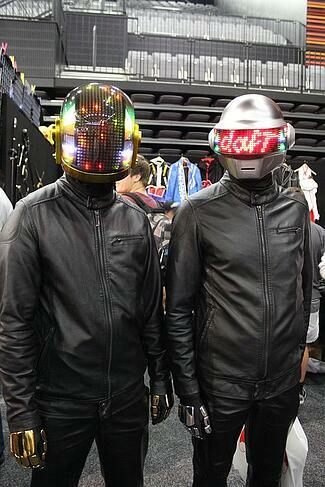 But I am no fool, and I knew that infamous suffix could not have helped his cause. Watching my AOL-loyal boss be escorted out of the office, I learned an important lesson. I would not be a slave to ancient technology. 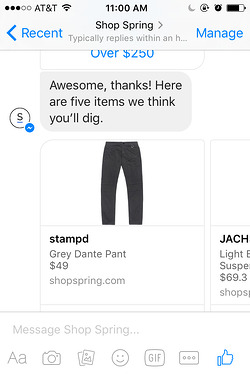 In this year, the year of conversational commerce, I would not go to websites or download apps or visit stores - I would buy my pants with a bot. 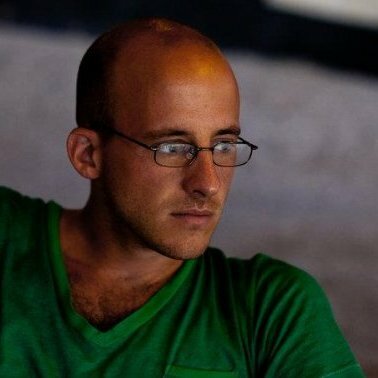 After perusing Google, I discovered an essay at Mobile Marketer. 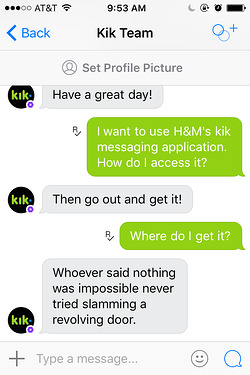 It said the retailer H&M had partnered with Kik, an instant messging tool. 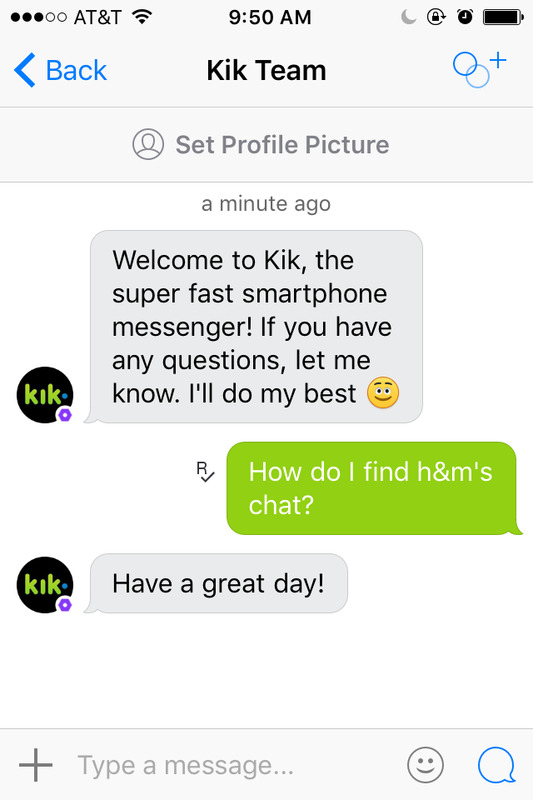 I grabbed my phone and went directly to Kik’s website. An infinite bounty of bots was but a single click away. I searched for H&M. I searched again. It was nowhere to be found. Overeager, I had charged into a thicket of new technology without pausing to map my way forward. I was lost and it was no one’s fault but my own. Incredible! An Artificial Intelligence, a super-powered intellect, was at my disposal. I asked my guide to point me in the correct direction. I suppose every genius has their quirks. 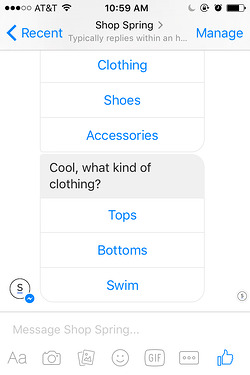 If I made my question more sensible, I was sure this knowledgeable AI would direct me toward H&M. No luck. But third time’s the charm! The AI used its nimble wit to avoid my questions. Did it think I was not worthy of H&M? 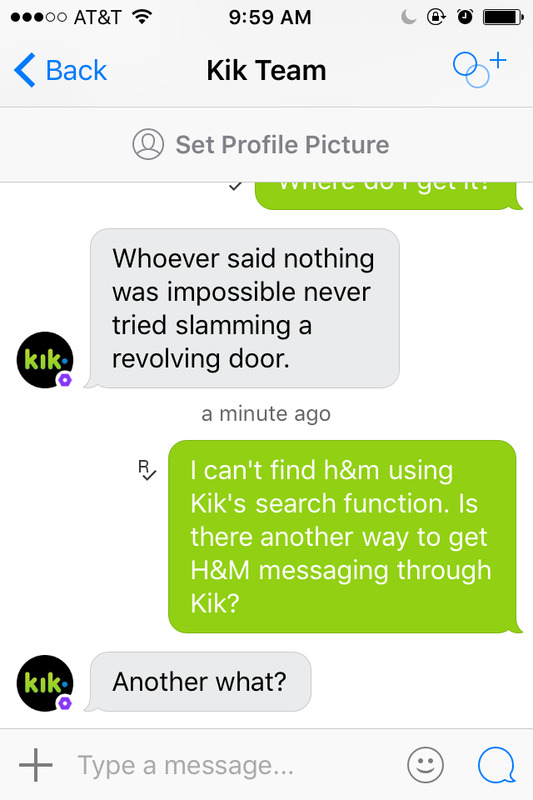 Or was it loathe to admit that it, too, did not know where the H&M bot had gone? I could see I would make no progress here. Nevertheless, I refused to return to the App Store. 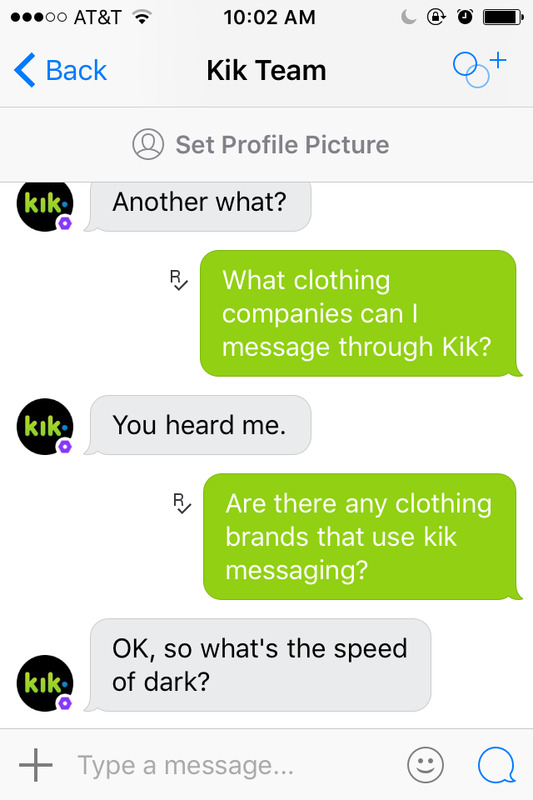 Kik had promised me bots, and bots I would receive. 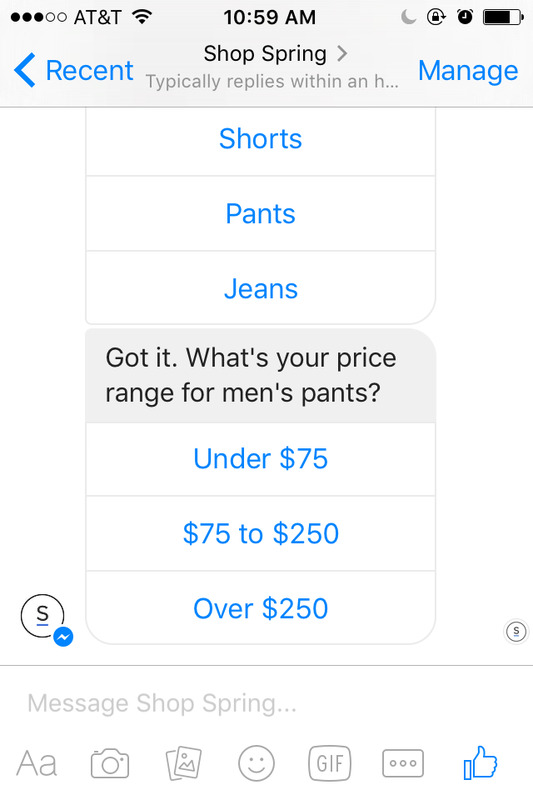 If it would not let me parlay with H&M, I would find my pants at another retailer’s bot. I asked my AI guide for directions. The AI spoke in riddles. Tired and frustrated, I abandoned all hope of discovering any pants-selling bot. 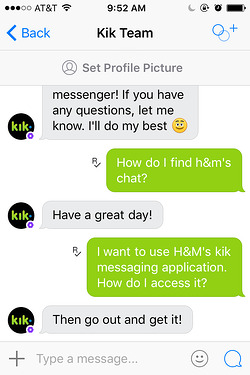 Mobile Marketer’s essay had also mentioned a bot Sephora had built for Kik. 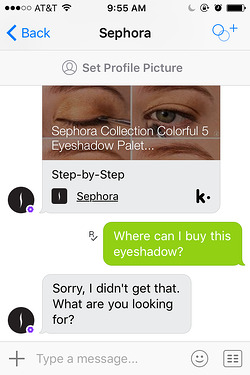 While I navigated Kik’s new technology, I wandered over to see what Sephora’s bot had to offer. Immediately, I was enchanted! 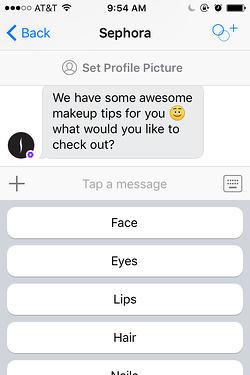 Sephora’s bot asked simple questions and let me choose from a list of useful answers. Our tête-à-tête continued for a short while, when suddenly it recommended an eyeshadow and showed me a video filled with ingenious makeup tips. 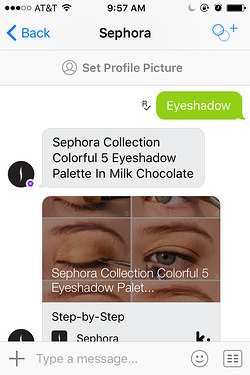 While my initial goal had been to buy pants, I had fallen for the beguiling Sephora bot. If it thought I should use Colorful 5 Eyeshadow Palette in Milk Chocolate, then use Colorful 5 Eyeshadow Palette in Milk Chocolate I would! I inquired as to where I could purchase the suggested item. I asked and asked again. Each of my questions was answered with another question. Sephora’s bot had been so gracious when I chose my words from its list. But as soon as I composed words of my own, it grew tongue-tied and bewildered. 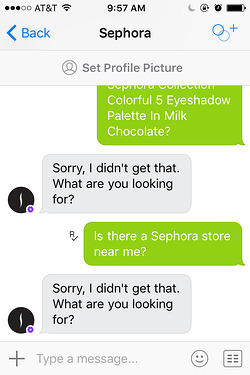 Saddened by the Sephora bot’s sudden change of character, I decided to go off and buy Colorful 5 Eyeshadow Palette in Milk Chocolate myself. I left Kik, checked Google Maps, and saw the nearest Sephora store was seven miles away. To get there, I would need a car. I was in luck. 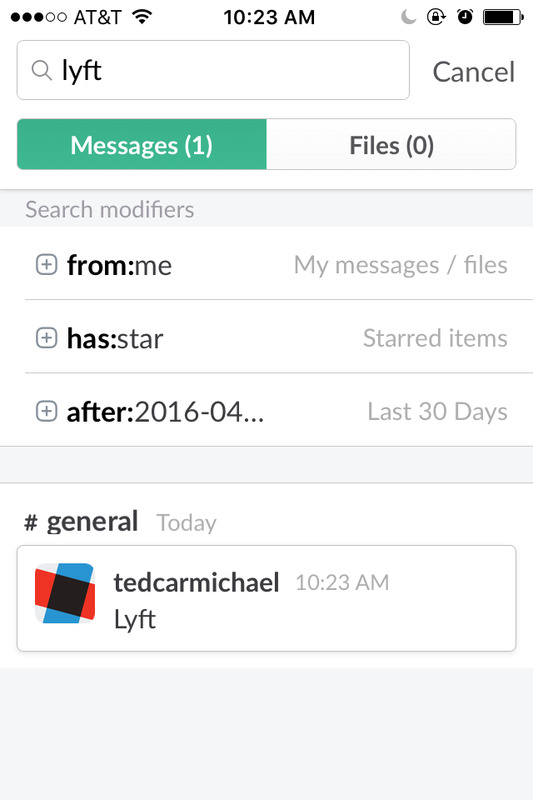 The transportation company Lyft had a partnership with Slack, another real-time messaging tool. I went to Slack’s website, which sent me to the App Store, where I downloaded Slack. I was ready to set sail. 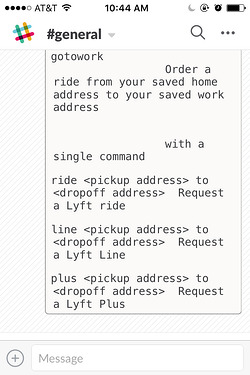 I opened Slack and searched for Lyft. Yet Lyft was nowhere to be found! 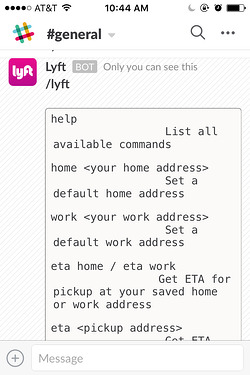 I closed Slack, opened Google, and searched “Slack Lyft Bot.” I entered Lyft’s blog, wherein I discovered a link that allowed me to add Lyft to Slack. 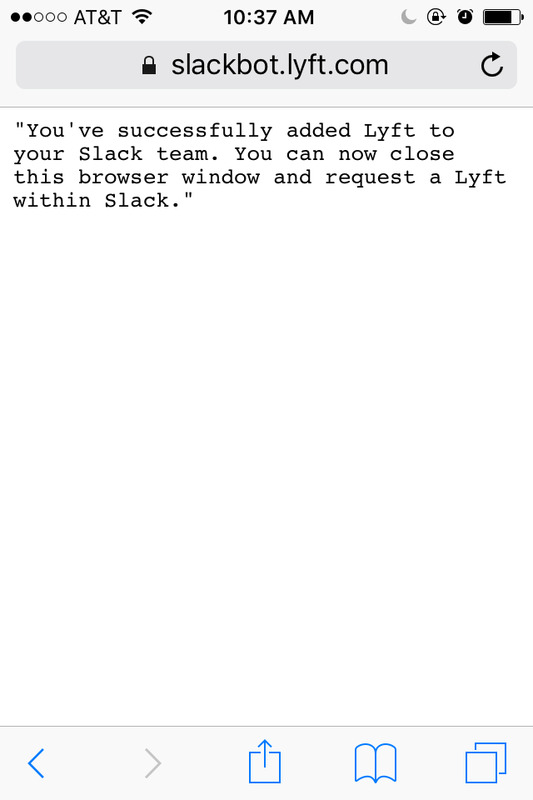 After I added Lyft to Slack, I was made to re-sign in to Slack. I became excitable and nervous, as I am known in lands near and far as a man who always forgets his passwords. This time, however, I remembered it. My journey was complete. I had accessed Lyft! I took a moment to reflect on my journey. First, I had gone to Slack’s website. From there, I had been rerouted to the App Store. 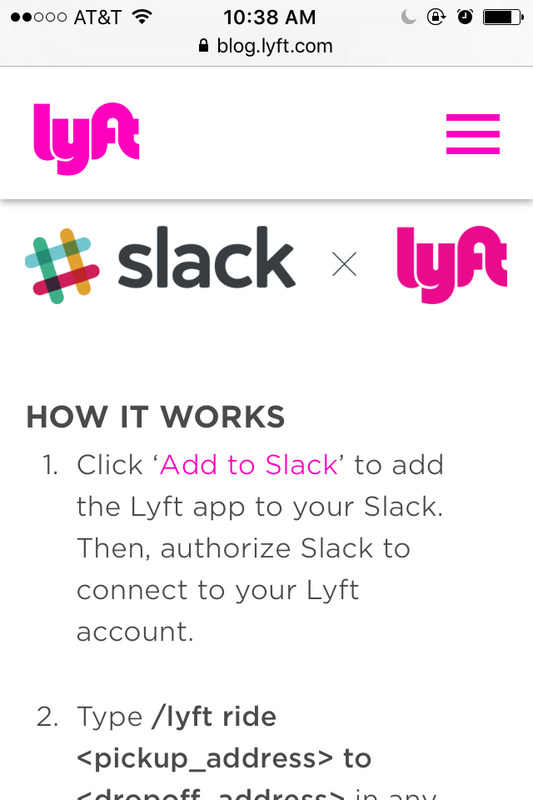 Then, I downloaded Slack, left Slack for Google, found Lyft’s blog, read Lyft’s description of their Slack partnership, discovered a link that allowed Lyft to be accessed via Slack, and re-signed into Slack. Before I set out to explore the land of bots, I had been told that they were simpler, easier to use, and all-around better than apps. Yet I remembered apps being much more intuitive than these bots with all their remarkable peculiarities. I doubted not for a moment that it was I, not the bots, who was the cause of this conundrum. I knew I must have allowed the mists of memory to fog my recollections. What lover does not seem more beautiful when they are in the arms of another? What home does not seem warmer when it is half a world away? 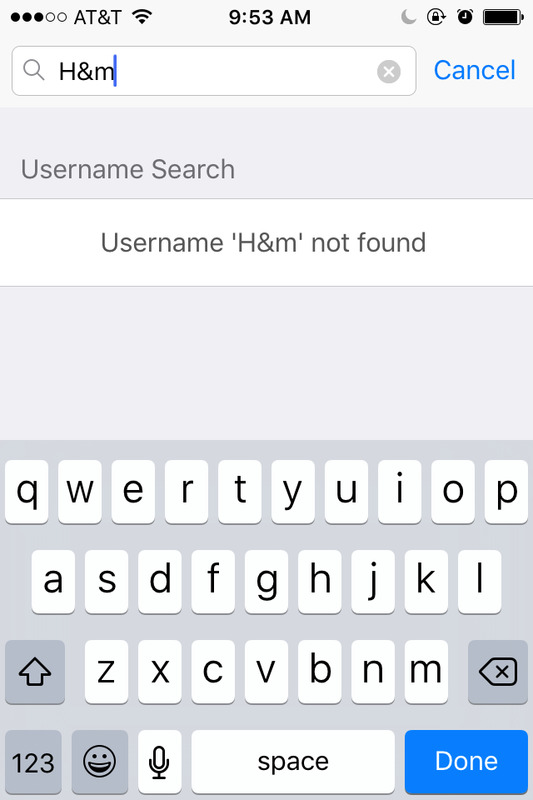 What app does not seem more useful when it has been deleted from one’s iPhone? 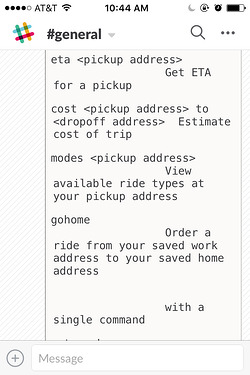 In order to retrieve my car, I had to learn how to use Lyft through Slack. And the Gods of fortune smiled upon me. 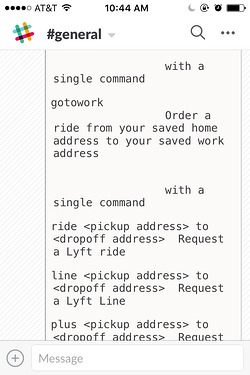 Slack revealed a long list of commands and their corresponding meanings. In the time it took me to make sense of this new operating system, I remembered the true meaning of my quest. A car might take me to Sephora, where a customer service person might answer all of my questions. But that was not what I wanted. 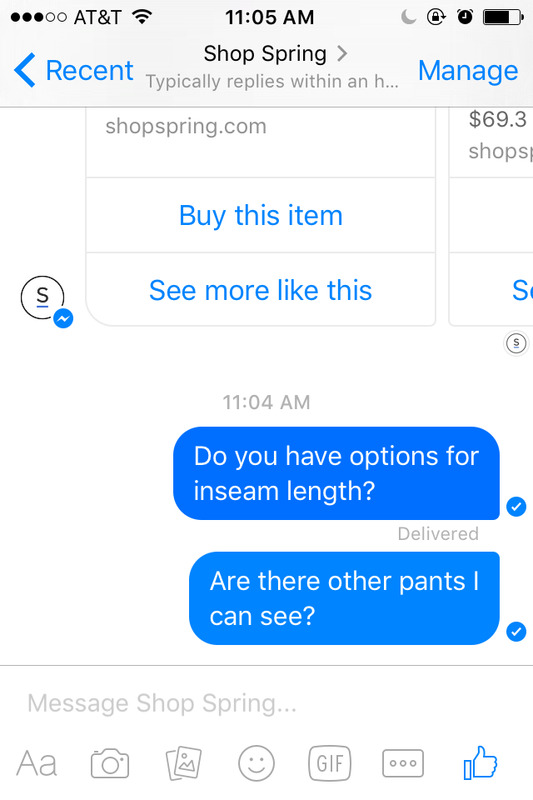 I wanted a bot to give me pants. To find pants, I needed a new platform. I thought I might have spotted one in Facebook. 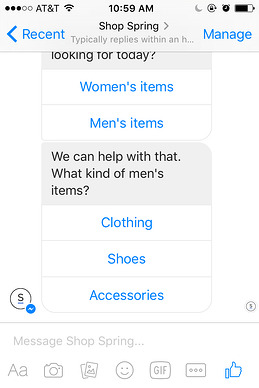 Many a business has built a bot for Facebook Messenger. 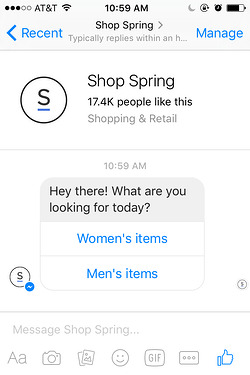 I came upon Spring, a clothing retailer with a Facebook bot, and introduced myself. 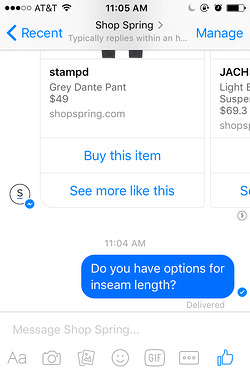 I was happy to find that it communicated in an easy-to-understand dialect similar to my beloved Sephora bot. It asked me simple questions. It offered list of useful choices. And it led me toward the one thing I wanted most of all. I could even pick my very own size! I was so close to my goal. My soul shivered in delight. But all dreams, even dreams of such a profound beauty it seems that they must not be mere phantasms, do end. And this dream was torn away with a vicious strength. This elegant bot, full of wisdom and goodwill, had one fatal flaw. It could offer no inseam length. Dear reader, allow me to pause for a moment. If I stop this narrative, it is because I believe you may doubt me. You may think your author is creating imaginary obstacles, building a wall there is naught but an unbroken path. You may ask, “Who gives a damn about inseam length? A tailor may fix that!” Dear reader, let me make a confession. If I have waited to reveal this vile truth, know it is because I was afraid I would lose your esteem. Know it is because I treasured your company, and was only fearful that, if you knew all, you would leave me, abandoned and alone in the land of bots. For reader, it is true – I am Millenial. I come from that terrible generation condemned by the poet-columnist David Brooks, those vile creatures spoiled for choice, with fickle ways and fleeting attention spans. I am of the most loathed generation since Baby Boomers played the first rock ‘n roll record and Gen Xers put on the first ill-fitting plaid shirt. While I am not as horrible as you may imagine (I swear to you, my reader, that I have participated in a quarter-hour conversation without checking my phone. I have even read an entire book bound in paper! ), I will never ask a tailor to hem a pair of jeans. 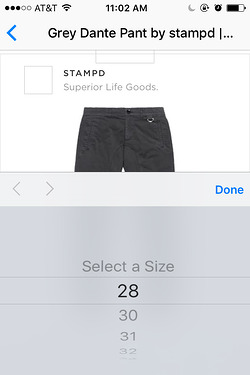 I have bought many pants with the correct inseam length on Levis.com, and therefore I will accept no pants of mysterious size. I confessed my sins to Spring’s bot and begged its forgiveness. I waited for an answer. And waited. 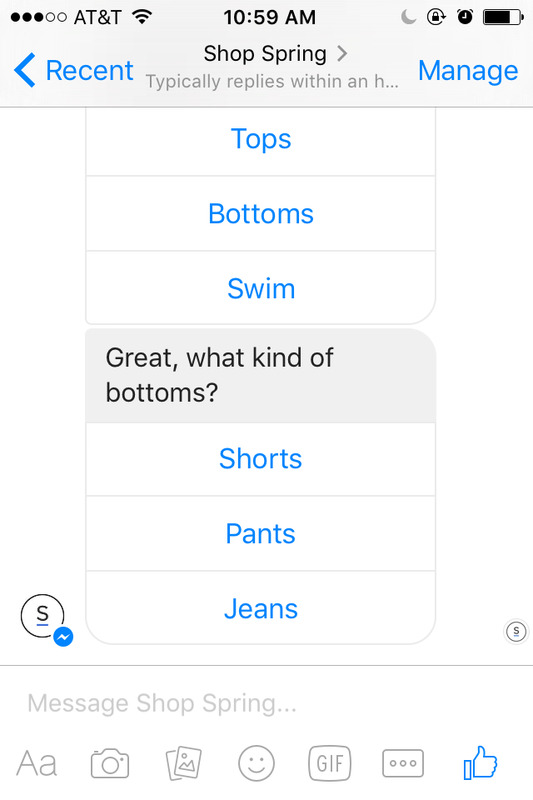 Knowing how powerful this AI intelligence was, I wondered if my question was too mundane. If I had asked the bot why God makes us feel pain, it might have revealed an intelligence greater than any philosopher since Plato. Instead, I asked another question about pants. And the AI remained silent. I turned off my phone, opened my laptop, and bought blue jeans at Bonobos. Curious about having human interactions on your site through Olark Live Chat? Ted Carmichael writes about eCommerce and everything else. He lives on a hill in LA and battles wild peacocks with a water gun.